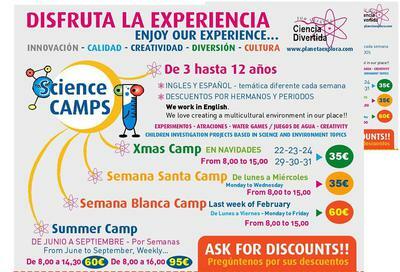 Planeta Explora Museum - Science Camp for Kids! Planet Explora is an innovative and fun scientific teaching space. Their pedagogy is anchored in the contents of the curriculum school and enlivened with an innovative and attractive methodology that supports and motivates the participants without forgetting the rigor in the proposed objectives. Planet Explora is a popular science museum space aimed at school visits located in Park Tívoli World in Benalmádena, Málaga. A new concept of leisure, fun and education. At Planeta Explora, participants will enjoy areas for discovery with their own research teams. During the visit, our educators dramatizarán and invigorate the visit with the intention of making it more fun and participatory. In the hour and a half that lasts the course, the participants carry out numerous activities. Activities are targeted toward children ages 3 and up, including secondary school kids. Planeta Explora hosts holiday and summer camps and you can even host a birthday party at Planeta Explora! Comments for Planeta Explora Museum - Science Camp for Kids!